A sea anemone can be thought of as an upside down jellyfish, that sticks itself to a substrate. The tentacles can deliver a sting that in most cases is not strong enough to get through our tough skin but can get to their prey in the sea. Sea anemones have one body cavity in which they take in and expel food. They sting their prey and pull it down into this cavity by means of the stinging tentacles. 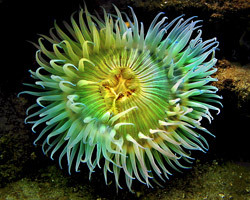 There are two main types of anemone that are found in the tide pool areas of Doheny and Dana Point. The solitary anemone, as the name implies, will be found as a separate creature on the rocks. 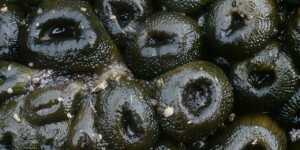 The aggregating anemones are much smaller and live in tight colonies. Photo above is a solitary anemone taken underwater with the creature open and ready to attract its prey. Photo below are of aggregating anemones that have closed up due to the recess of the tide and their exposure to air.